Sunday, Day 4, inside the Woodlands at Dover Downs saw the return of the sunshine upon the Firefly Music Festival, however it did not get as hot as it did on Friday and frequent sprayings by water trucks controlled the dust along the roads. Getaway day featured a lighter schedule, but still packed with some top talent. The two early performances were both by Australian acts, one by singer-songwriter Vance Joy on the Lawn stage and the other by indie rock band The Griswolds on the Big Break stage, sharing the prize for being furthest from home. We got the chance to talk to both of them (look out for the podcast interviews soon) and they couldn't have been more excited to be here. Check them both out when you get the chance. Folk rock band The Lumineers took the Main stage after Weezer. These guys from Denver, CO, are more than just “Ho Hey” and their performances are perfect for a festival setting. The organic and intricate tones of the acoustic instruments and the nuanced vocals of lead singer Wesley Schultz ride over the crowd and creating a homely and intimate setting. Back over on the Backyard stage, the electronic rock act from Greenwich, NY, Phantogram, is quite the juxtaposition. Sarah Barthel and Josh Carter create a sonic landscape of beats, swirling guitars and keys, and Barthel's almost ethereal vocals. The energy between the stage and the crowd goes back and forth, making it hard pressed for anyone not to dance. 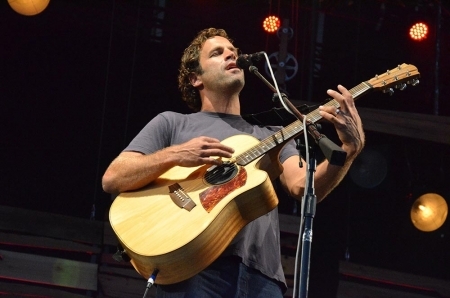 Headlining on Sunday night was everyone's favorite Hawaiian surfer, filmmaker, and mellow rocker Jack Johnson. Heard at many a backyard summer barbeque since releasing his debut album Brushfire Fairytales in 2001, Johnson knows how to put out the good vibes. He played with a full band (bass, drums, and piano) and that full sound was more than enough to carry the fields. The stage had a cabin motif with wood planks hanging as a back drop, intimate lighting, and an overhead lamp dropped down right above Johnson's head. A great way to slow down and end your Firefly weekend. Now if you still had some party in you, Childish Gambino, was also playing over on the Lawn stage. This is the stage name of actor/comedian Donald Glover who may know from NBC's Community. The rapper drew a large crowd on Sunday evening, putting on an energetic, non-stop, and at times frenetic set. Glover was definitely a crowd pleaser and a showman. He also proved that he really can command the stage as a musician. He finished the show with “Bonfire” during which he gratuitously utilized a couple a giant flame cannons to engulf the stage with fireballs. But, there was one last hoorah to the night. EDM act Big Gigantic from Boulder, CO, closed out the night and weekend with a bang on the Backyard Stage. The set began with a fireworks display off to the side as they took the stage. The duo combines electronic beats and loops with live instrumentation. Dominic Lalli controls the production but also plays saxophone and Jeremy Salken provides lives drums. The crowd pulsed and moved to the wave of the music and the deep bass was enough to turn your kidneys to rice pudding. Everyone was having a blast though and Big Gigantic kept feeding it to them. Firefly Music Festival 2014 had something for everyone who came. There is so much I did not see that I am sure was terrific. A festival is a great way to discover new music, see people you may not get a chance to otherwise, or just have fun watching one of your favorites. Whether you had the chance to stand up front along the rail for a set, or you were at the Landshark bar watching that tense USA vs Portugal World Cup match with a few hundred people with Broken Bells playing in the background, there were all sorts of ways to enjoy yourself. There isn't one best way to do a festival right, only if you enjoyed yourself.